Time's running out to check off that gift list! Good thing that the Made in Philadelphia Holiday Market at Dilworth Park is open every day through December 27, with local artists, crafters, confectioners and designers. 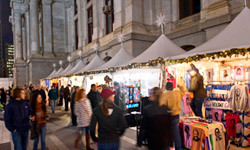 Right next to City Hall, holiday shoppers can find unique gifts and special holiday foods, from local artists like Philly Word Art, designers like Beaucycled and Saffron Creations, crafters like soapmaker Mahogany Essentials and candlemaker Accent Aroma. The Artisan Bakery includes T Bake Shoppe, Picket Fence Confections, gourmet chocolates by Tradestone Confections, and flavored kettle corn by Philly Pop Kettle Corn. Philly Snack Food serves up Philly Pretzels, Potato Tornados and Mini Donuts along with hot chocolate to enjoy a pleasant winter day at Dilworth Park. DilworthPark.org/madeinphiladelphia. 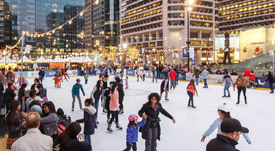 The Rothman Institute Ice Rink at Dilworth Park is open every single day through the holidays on the west side of City Hall! Admission is $3 for children ages 10 and under and $5 for adults. Skate rental is $9. Plus, the new Rothman Cabin is steps away from the rink with tasty food and drink from Rosa Blanca Café. The Rothman Institute Ice Rink is sponsored by Rothman Institute, PNC Bank, 6abc, and Temple University Center City. Visit DilworthPark.org/rothmanicerink for hours, events, rental information, and more. Center City District Restaurant Week is coming! From January 17-22 & 24-29, participating restaurants will offer three-course dinners for only $35 and three-course lunches for $20. Click Here for the full list of restaurants, menus, and easy online reservations through OpenTable. You can also enter the contest for 52 gift certificates from Center City restaurants! Follow us on Twitter, @PhilaRestWeek, for the latest #CCDRW news. Philly PHLASH runs through January 3, 2016, with route stops near the city's most popular holiday attractions and shopping districts, and is easily accessible from regional rail and major transit connections. There is also a special transfer loop via stop 11 to connect with the Historic Houses of Fairmount Park tour. The Philly PHLASH runs daily, every 15 minutes, between 10am-6pm. It's only $2 per person, per ride, or $5 for an all-day pass. Children under 4 and seniors ride free. For a list of all stops, go to PhillyPhlash.com. PAWS (Philadelphia Animal Welfare Society), the city's largest no-kill shelter, has reached a milestone. They recently served their 100,000th animal with rescue, adoption and low-cost spay/neuter and vet care services. Come celebrate with staff, volunteers and supporters at Barra Rossa on December 18 at 8:30pm. A $20 cover includes two drinks and light fare. Stay for dinner and Barra Rossa will donate a portion of your bill to PAWS. For more information, go to PhillyPAWS.org. Snowy. Jewish. Happy. Caring. Buddhist. Generous. Family. Creative. Friendly. Sparkly. The National Museum of American Jewish History wants you to fill in your own blank and join them for their annual day of family fun, December 25, from 10am-5pm. The day will be full of activities, including live music, arts and crafts, face painting and more. You'll also have the opportunity to explore the museum and experience 360 years of American Jewish History. Ring in 2016 a bit early, with music, crafts, and the Square Drop from atop SquareBurger at 6pm. Plus, SugarHouse Casino's New Year's Eve Fireworks on the Waterfront at 6pm are viewable from the Square. The park remains open until 8pm for a Kids Dance Party in the indoor pavilion and the final Electrical Spectacle Holiday Light Show of 2015. Free.